My intercontinental transition is more or less complete, and with a new home comes a new array of toys. For the last week or so I’ve been using a home-grade lightweight department store PC as a test bed. 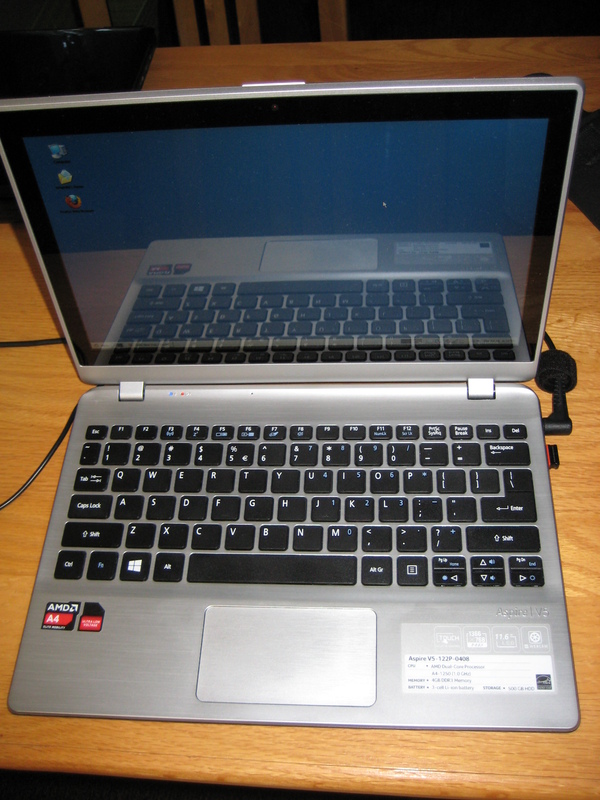 This is an Acer Aspire V5-122P. It’s been a long time since I bought a new computer, and ordinarily I would be averse to it. I was losing time though, and had no local connections for leftover hardware, and this had the right price on it. My personal opinions are sometimes one way, and sometimes the other. It’s got terrific battery life, which is not something I’m used to. It’s very light and has a strong display, which are also things I’m not used to. And I can honestly say this is the first computer I’ve ever had with a touchscreen. On the other hand, I am used to machines that run me US$20 or so at the max. This was a good deal more than that, even if it was a bargain-basement price. But I can hardly complain. This is running Linux Mint 15 (as you might have noticed) without effort, setting up perfectly and with no complications save a failure to properly turn off. No biggie. My plans include a shift to Arch and a different window manager to be sure. Mint with MATE is a little laggy on this. After that, probably drop back to console applications. And there you have it. This entry was posted in Hardware and tagged hardware, system on 2013/07/18 by K.Mandla. Nice laptop, but why do you run a 32-bit system on it? No reason. I had a 32-bit live USB on hand, and used it first. One thing you ought to check that might go unnoticed; is the cpu governor running ondemand or in performance mode? The former will extend your battery’s life and hopefully make your laptop’s fan more pleasant to your ears. I was installing linux (some debian-based distro, can’t recall) on a friend’s Sony netbook and the BIOS just wouldn’t co-operate with anything 😦 full Ghz/full fan speed almost at all times. Good point. This does seem to run the fan a lot. I’ll check and make sure. Cheers! Does the touch screen work with Linux Mint? Yup. Touch, double-touch, tap-and-drag too. hi have you found a solution to the shut down issue? No, I never did. It happened in every distro I tried though, so I assumed it was just a new hardware feature that would take time to resolve.